High-resolution single-nucleotide polymorphism array and clustering analysis of loss of heterozygosity in human lung cancer cell lines. Chromosomal loss of heterozygosity (LOH) is a common mechanism for the inactivation of tumor suppressor genes in human epithelial cancers. 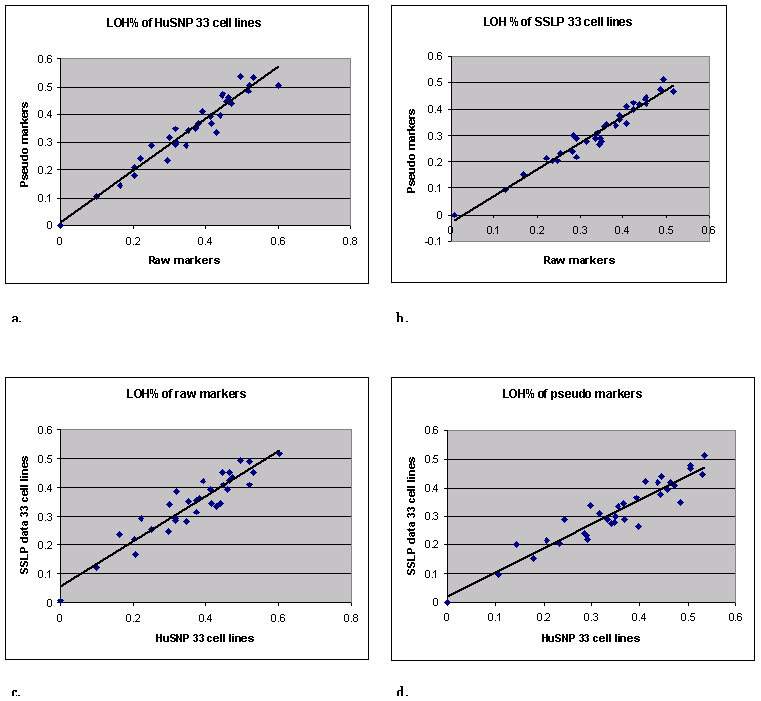 Hybridization to single-nucleotide polymorphism (SNP) arrays is an efficient method to detect genome-wide cancer LOH. Here, we survey LOH patterns in a panel of 33 human lung cancer cell lines using SNP array hybridization containing 1500 SNPs. We compared the LOH patterns generated by SNP array hybridization to those previously obtained by 399 microsatellite markers and find a high degree of concordance between the two methods. A novel informatics platform, dChipSNP, was used to perform hierarchical tumor clustering based on genome-wide LOH patterns. We demonstrate that this method can separate non-small-cell and small-cell lung cancer samples based on their shared LOH. Furthermore, we analysed seven human lung cancer cell lines using a novel 10 000 SNP array and demonstrate that this is an efficient and reliable method of high-density allelotyping. Using this array, we identified small regions of LOH that were not detected by lower density SNP arrays or by standard microsatellite marker panels.